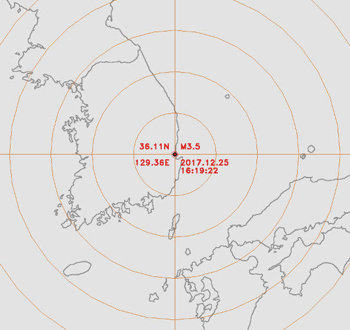 A 3.5 magnitude earthquake occurred in Pohang in North Gyeongsang Province on Monday afternoon, an apparent aftershock of the 5.4 magnitude quake in the area on Nov. 15. Fifteen minutes later, a 2.1 magnitude aftershock followed. Resident in Pohang and nearby Gyeongju and Ulsan said the felt the walls and furniture shake. The Korea Meteorological Administration said aftershocks are common for a few months after an earthquake over 5.0. The region has suffered some 72 aftershocks, seven of them of a magnitude over 3.0.